The gun debate has been revived across the nation as two pro-gun control Democrats in Colorado lost a recall election after voting for a law imposing stricter gun restrictions that would limit magazines to 15 rounds and require universal background checks. Missouri's state legislature came within one vote of overriding the Governor's veto of a bill that would essentially void all federal gun laws. Ousted Colorado State Senate President John Morse and gun rights advocate Will Cain join hosts S.E. Cupp and Van Jones in the Crossfire tonight to debate gun laws. We want you to weigh in: Would banning high capacity magazines reduce gun violence? Vote below or tweet your response using #CrossfireReturns. You can also vote by commenting on our Facebook post. You can view the real-time results below or on our Poptip results page. 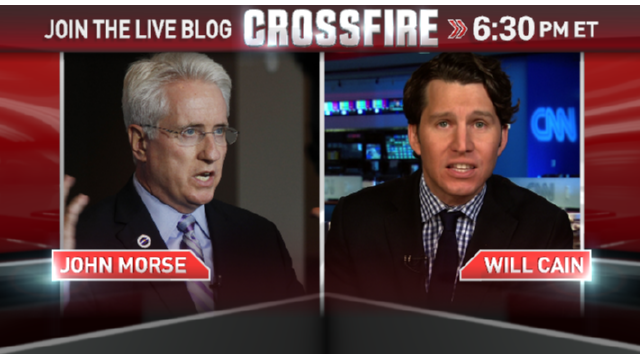 During the show, join the conversation with #CrossfireReturns on Twitter and Facebook or participate in our live blog at crossfirelive.cnn.com. US doctors have compared the rate of firearms-related deaths in countries where many people own guns with the death rate in countries where gun ownership is rare. Their findings, published in the American Journal of Medicine, debunk the historic belief among many people in the United States that guns make a country safer, they say. On the contrary, the US, with the most guns per head in the world, has the highest rate of deaths from firearms, while Japan, which has the lowest rate of gun ownership, has the least. Coming originally from Europe this didn't surprise me, but Will Cain kept mentioning "studies" which showed the reverse. Americans don't seem to look at international comparisons. There was nearly a week to vote for the recall.. including one Saturday. There was NO voter suppression. They got kicked out because they wanted to play King and go around us and the process that a Representative should be doing and We said we had enough. The gun bill was the big one that pushed us over the edge, but there was much, MUCH more to this recall than the gun laws and the way they were pushed down our throats. And as it has been stated, gun laws do nothing about the criminals whop do not follow the laws. Columbine and VA Tech were both mass shootings done with limited capacity (10 round) magainzes. Didn't hamper the crimnals attackers much from firing around a hundred rounds and 170+ rounds respectively. Magazine changes aren't much of an inconvienience when you are the attacker and people are cowering or running away. However, when you are the defender, a magaizine change means the difference between life and death for you, your family or whomever else you stand between the attackers and them. In the middle of the night when you are awoken to the sound of breaking glass and grab a gun from the nightstand – you won't be dressed to carry extra magazines, only having whatever your gun can hold. How do you tell your daughter that wasn't enough to drive off 5 men invading the home, that after the warning shots and gunfire in the dark, you ran out of ammunition, they took her off and now you are the one burying her praying and saying "sorry it wasn't enough." It only takes one bullet to take a life, but it often takes many to save one. Prime reason is one shot can kill someone hours later, but to stop a deadly attack you likely have to hit the attacker several times. Under stress accuracy suffers. Its almost comical to observe the liberal contradictions on an armed person's ability to defend themselves. At first the liberal says carrying a gun is too dangerous, a person would spary rounds all over and hit everyone except their target (kind of like NYPD and the Empire State building Shooter last year). Then when trying to argue for restricting your ability to carry adequate material for defense against multiple possible situations, the liberal argues that you are deadly laser accurate and need but a couple rounds to put down a dozen gang members... Make up your minds on which false argument you are going to advance but please don't contradict yourselves, you'll look even more foolish and frivolous like Rep Hollinghorst the other night. Anyway, screw you Morse you sanctimonious prick. In the governor's forum on "Gun Violence" you were the one who related the story how as a cop when you fired a round and had any opportunity you would exchange a full magazine into the gun – knowing that having as much ammunition immediately available gave you the best chance of prevailing and saving your life and those of others around you. A sickness has been lifted from Colorado – John Morse, a sickness. Will, a great debate tonight with great arguments. Unfortunately, it was the wrong argument. We don't have gun violence. We have criminal violence. None of the "gun control" bills/laws address criminal violence. That's where your debate should have been directed. Thank you for your stronge stance on the 2nd amendment. Tonight, we saw ex-Senator Morse admit on national television that the 15 cartridge magazine limit he helped push through in Colorado was "arbitrary", that he didn't know that one of the biggest employers in Colorado was leaving the state as a result of the new law, and that the Second Amendment applied to "one bullet"! These comments must have been quite an eye opener for people in Colorado! The Civil War was not our most casualties, WWII exceeded that. What the Civil War was in those terms was more lethal per capita because old tactics of massed formations met against greater accuracy and killing power of contemporary weapons whilst medicine had not yet gotten to the point of patching people up beyond butchery (amputation and cauterization). In fact, the first instance of internal medicinal surgery resulted from a uniquely wounded soldier who did not die from his gut wound, but had a flap of skin that could be bared allowing the doctor to observe his stomach et al in action. If you want to clean up the majority of the killing its mostly done in certain areas, by certain people, in trade of certain goods. We have always against most of that, but there is always a push back by certain people against holding other certain people accountable for their actions. I could not believe your discussion today. Where is the sensible person who sees the carnage as a result of mass shooting and agrees that the least we should be doing is making it harder for a maniac to reload! This is not about our rights- it should be about preventing eveni one more senseless shooting. how about having some of the parents from Sandy Hook in studio while you are all shouting at each other. Because going after hardware is brain dead and stupid policy. It disarms only those who follow the law just like prohibition only sobered up the law abiding. Criminals will always have guns. Per CDC numbers, every week there's the equivalent of a Sandy Hook Elementary slaughter of innocents on our highways – directly attributed to alcohol abuse. We don't ban fast cars because people drive drunk. We don't force liquor stores to sell only airline sized bottles. We don't do instant background checks at the register to prohibit sales to people who are known alcohol abusers. We don't ration purchases of alcohol to one bottle a month. We don't require bottle locks to be sold with booze. Or ban high proof (assault) liquor. Or have waiting periods to buy Jack Daniels. No, we all hold the drunk accountable. The real reasons liberals hate the hardware is that it limits their ability to exercise top down control over the masses..Only a fool thinks a party in power would never rig an election.. Like Uncle Joe Stalin said, you don't need to control the voters, you just need to control the vote counters. The founders expected the population to have the same small arms as the army. Morse conveniently left out that the army only had "one bullet" rifles too. I dislike Crossfire just as much as I did years ago. The only sane person on the panel is Van Jones. He is measured and speaks calmly. As for S.E. Cupp, she is abrasive, rude, loud, and always ready to pounce as shown by the disapproving faces she makes when she disagrees with someone on the panel, or worse yet, a guest. She is hardly a good role model for courteous civil discourse and respect for others. I think she must go. So you figure S.E. Cupp is like Piers Morgan, Chris Mathews, Soledad O'Brien & other abrasive, rude and scurrilous liberal mouthpieces then. Fine, she can retire along with the couple dozen like her on the other side. As for Van Jones, he seems reasonable for a Bolshevik, but then they aren't reasonable at all. CNN et al is false news. At least Fox will cover stuff that these networks try to cover up by omission. A good current example today is the shutdown. Republicans in the House voted on and passed bills to fund all government agencies in 20 some bills that Harry Reid refused to take in whole or in part for a vote in the Senate. The decision to shutdown the government was Reid's and by proxy Obama's simply because the one item that didn't have a funding bill forwarded was Obamacare. That wasn't forthcoming because of the crony exemptions and other issues Republicans have with it. However, Reid & Obama decided to shut down the government agencies over it, not Republicans. Yet CNN et al try to say it was Republicans that did it. Lies, pure & simple, but some of you lap it up like spilled milk on the barn floor. We all know what else you'll pick up off the barn floor. Will Cain comes off as frustrated , angry , and petulant. He is too difficult to watch. Though a rigorous intellectual debate is interesting , Will needs to get back on his meds. BTW , I own 7 long guns and 5 pistols and shoot them all expertly for their intended purpose. Cain is a paranoid gadfly in need of a forum. Too bad you have tainted your otherwise fine show with this guy who simply comes off as unstable. I hope he doesn't own a gun. I usually don't watch Crossfire. Congratulations, the pro-gun advocate was so full of caca, that I'm sending a contribution to Gabby Giffords. To say that the reason that violence is down is BECAUSE there are more guns is the kind of sloppy statistics no one with even an average IQ would swallow. I guess, the flip side would then be that if all parents gave up their guns, more children would die by guns. Right?Don't confuse correlations with cause. sen. john morse lost, because those of us who dont want guns, or hunt moose from helicoptors. have to work. many of course not all, but aparently 28% of gun nuts, r rich enough to make time to vote for guns. i guess the voters who voted sen. morse out took time off from thieir organized militias to keep the 2nd amendment alive. and voted.